Instrument sterilization is essential to the functioning of many industries. There are several accepted methods that are used to ensure that instruments are sterilized properly. Below we describe 3 of the most common types of sterilizers used in the medical field. Regardless of the type of sterilizer you use, the CDC recommends verifying the proper functioning of your instrument using a weekly spore test. Find out more information at www.WoodhouseLabs.com. Also referred to as an autoclave, steam sterilizers are the most common popular type of sterilizer, due to their versatility and ease of use. 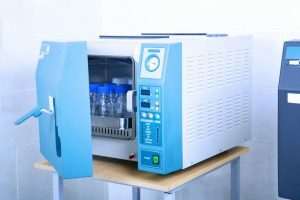 There are two common types of autoclave, gravity displacement or pre-vacuum-type, however both rely on a combination of high temperature, high pressure, and time. Sterilization times range from 4-30 minutes depending on the temperature and the load type (wrapped vs unwrapped instruments, liquids vs solids, etc). Most autoclaves include a drying cycle which can last from 25-40 minutes. See your manufacturer’s instructions for exact requirements. Dry heat sterilizers are often preferred by clinics exclusively sterilizing metal instruments, as these sterilizers do not require steam which may cause corrosion and dulling of metal equipment. Dry heat sterilizers rely on high temperatures and extended time to destroy microorganisms. Sterilization times range from 12-150 minutes, depending on temperature and manufacturer’s instructions. Chemical sterilizers are the least common form of sterilization, due to their cost and potential hazards if handled incorrectly. However, when used properly, chemical sterilizers offer the benefits of both steam sterilizers and dry heat sterilizers – resulting in the reduced wear of metal instruments while requiring a shorter sterilization time. Chemical sterilizers use either Ethylene Oxide (EtO), or a combination of alcohol, formaldehyde, ketone, acetone, and water to create a chemical vapor for sterilizing. Like steam sterilizers, they also rely on a combination of high temperature, high pressure, and time. Sterilization times typically range from 20-40 minutes, similar to that of steam sterilizers.